This is my first time taking part in the blog link-up hosted by Sheryl at A Chronic Voice. I have been following her link-up for a few months now, the prompts are great and I always enjoyed the posts I read! At the start of August, I went out with my family for a few hours. It was my mum’s birthday and we went to a craft store and had lunch out. I was in my wheelchair and had all my usual gadgets and goodies to help minimise the impact of the outing, but somehow that bit of fun completely wiped me out for weeks afterwards and even then, I never really recovered back to my prior state. It is now 30 December and I have only just been out again this week. After 5 months indoors! I again used the wheelchair, but there was much more driving involved and even a bit of shopping. (I don’t drive, I sit in the back, but just being in the moving car causes it’s own problems). I am pleased to tell you that I have been feeling quite good since my outing and I am super optimistic about this improvement! I hope this means that I am recovering from this 5-month long flare and can once again start my creative projects which have been on hold for way too long. I am excited to set new health goals for the year ahead and hopefully spend less time on my back and more time at my desk! Shopping in a real shop! This holiday season has been very different for me. I didn’t buy gifts, mainly because I can’t work in my condition, so I don’t have money of my own to spend. We did however, as a family, make use of internet shopping and the others went out and bought gifts on my behalf for each other. It was also my family’s first Christmas together since I fell ill over 2 years ago, so our parents went all out and did loads of shopping for us. Nothing extravagant as I had already got my main Christmas gift sorted in advance when the sales were on in November, but it was quite fun to get little gifts sprinkled over the whole month. Each time they went out, they’d come back with something small – slippers, a fluffy hot water bunny, a cosy blankie – it made for a very festive season! And then, a few days ago when we decided I might be ready to finally go out again, we ended the day out with shopping – out in a real shop! It was so good to just be out doing normal people things like browsing the isles of a huge store and seeing other humans. So much to see, touch and smell. It was a carnival for the senses! When I fell ill in 2015, my family was living in Italy, my parents and my sister. By the end of that year, my sister had moved over to live with me in London to be my carer. A year later my parents moved over to be close to us too. This year was our first Christmas together in a few years and it has been wonderful having them here in our house for 2 weeks over the holidays! Family time has been great. Mum-cooked meals, movie nights, card games, outings, long chats or even just all sitting quietly in the same room doing our own things, but together. They don’t live terribly far from us, but we usually only get to see them at the weekends – on their days off. It’s usually a rushed time of grocery shopping, cooking my special meals for the freezer, cleaning up, and then before we know it, time is up and they have to go back home. So it has been great to have this extended, more relaxed time together. The holidays are always full of fun and laughter, but also full of memories – of the people we have lost along the way and memories of “the good old days” when things were different (and in our memories perfect…) but life isn’t linear, things change constantly and nothing is every really perfect. This year was no different. But I do not like to hang out in the sadness that comes from dwelling in the past, so instead of wishing the past were the present, I enjoyed a lovely walk down memory lane recently as I recalled our wonderful summertime Christmases in Africa where I grew up, and then came right back to the here and now to make the best of my time with the family I have with me now. It’s time to look forward to the new year ahead! As this year comes to an end, I feel like it has crept up on me quite quickly. Time really flies! So much happened this year, from my parents moving to the UK and settling in their new home and jobs, to my sister and I moving out of London into a bigger (and cheaper) flat, to huge improvements health-wise as I am no longer bedridden. With so much going on, it still feels like it was only yesterday that 2017 and all it’s adventures began. I am super excited about 2018 though – I have some fun plans I can’t wait to put into action and some health goals I hope to reach or even exceed. I have so many ideas for this blog and plans for my art, I only hope that my body will play along and continue towards recovery. In preparing for the year ahead, I have made resting properly a priority and it seems to be helping. Prevention is better than cure – specially since there is no cure for ME/CFS (yet! ), so making sure I don’t cause unnecessary flares or relapses has to be high on the priority list. I have created a daily schedule to include all my creative and social media goals as well as my rest breaks and days off. The aim now is to make this schedule as flexible as possible to accommodate my condition, but also try to keep it as stable as possible because that is where I thrive best – with structure and purpose to each day. Quite a balancing act! I think that, most importantly, it is vital to be kind to ourselves – living with a chronic illness is so unpredictable – we should allow ourselves to let things go and sometimes say no to things, even when we would like to say yes. I know I hate having things on my to-do list undone, but I must remember that if things can’t get done, it’s okay. Tomorrow is a new day and I get to try again! I have enjoyed letting the prompts just guide my thoughts. 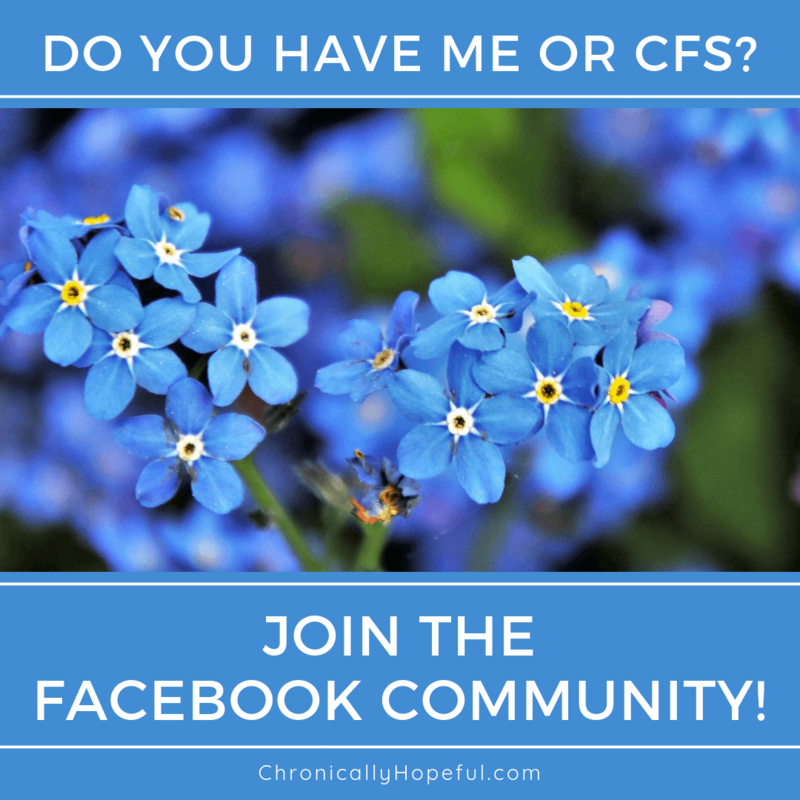 I hope you will join us over at A Chronic Voice and take part in the monthly link-up too. To see this month’s entries by other bloggers, visit this page. If you’ve come over from the link-up, please say hi in the comments below, I’d love to stop by your blog too. I hope your 2018 will be all you hope for and more.